Small trees and grasses and shrubs emerge from reddish-yellow sand for as far as you can see. Occasionally we saw a Kudu, a red Hartebeest and other creatures as they crossed the road and ran into the bush. We are in the fabled Kalahari Desert in Western Botswana. Home to the infamously fierce black-maned lions of the Kalahari. The huge expanse of dessert that encompasses most of Botswana, and it is mostly empty to our eyes with the exception of occasional livestock grazing free-range and one straight-line road heading East across the southern continent. To me it looks beautiful as a large expanse, but monotonous as the miles roll on and on. We have just left Windhoek, Namibia on our two week camping safari. We are in a comfortable vehicle with two other guests – a fun couple from Australia – and our Namibian guide Marcus and the camp assistant/cook Joseph. Our first day was a long drive, and we rolled into our campsite a couple of hours before dark, set up tents, and settled in for a tasty supper. He came back at 7 AM to take us on a bush-walk and share with us how his people – the San – have traditionally lived here – in the hard desert – for many generations. While now the local Bushmen mainly live in a village 40 km away where they live in houses and can buy clothes and go to the supermarket and go to the hospital, they still prefer to go to the bush first for their traditional ways and foods. They bring their children to the bush to teach them their traditional ways starting very young. Many still prefer to wear animal skins over western clothes. They still come and harvest berries and fruits and hunt in the ancient way. And they still maintain a healthy separation from outsiders and prefer to be apart from outside influences. We roll out of the tent early after a cold night and dress and get ready for our walk. Our guide – his name is un-writable in English and starts with a click sound distinct to the local languages in this part of Africa – is waiting for us. He is dressed a fleece pullover, with his long bare legs sticking out from under the shirt. Feet in Tevas. He wears traditional skins under the fleece. He carries an animal skin quiver with a bow, a spear and various sticks slung over his shoulder. And has a patient smile as he waits for us to get organized and accumulate all of our comforts and cameras and pack up luggage and assemble all the complications of modernity as we get ready for our walk. And he’s the real deal, not someone who puts on the costume for the tourists. His gear is well used. His body is lean and tall. His skin is copper-brown and pulled tight across high prominent cheekbones and hollowed cheeks. And he is clearly at home here in this desert. He shows us the tree where you chew the leaves and spit out the juice to chase the spirits away before dancing. The succulent that is the source of fibers for ropes that the set into snares. The two wooden sticks carved to work together to make fire, and the two specific trees used to make each part of the fire-starter. 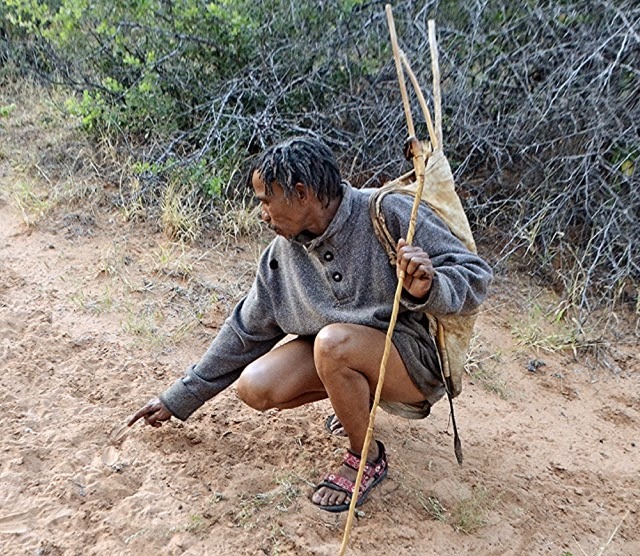 A specific bush is used to make pointed digging sticks, something all bushmen carry in their quiver along with a spear, a small wooden bow with a gut string, and the small poisoned arrows that kill big game like a giraffe in under an hour from a tiny arrow. “Animals are very clever, and very hard to catch.” The men go hunting in the winters for three months – June, July and August – and hope to kill four or five big animals and dry the meat so they have meat the rest of the year. They hunt in the winter so the raw meat doesn’t spoil. They have hand signals mimicking the horns of their game used to silently communicate the type of animal tracks they see, how many days have passed since the tracks were left. And astonishingly to me, when they are out in the bush they get all of their water from plants … there are no streams or pools. And so in less than an hour, what was a large, monotonous desert suddenly became a place where filled with food and medicine and creatures and life. And more, it came alive as the home to a remarkable people who still protect their traditional way of life, while adopting to the modern world. These same people – the San – who many archeologists believe hold the common genetic heritage for all humans alive today. And as we climbed back in the truck to head North to the Okavonga Delta, we could look out the window and really see this desert. Which just reminds us again how we often need a guide to open our eyes to what’s in plain sight.